This is not the first time that classical singer Bombay Jayashri is being associated with working for a cause. For five years now, she and her student Abinaya Shenbagaraj have been doing sessions with around 20 autistic children (in partnership with Ability Foundation) every Saturday. The singer, who believes in the therapeutic value of music, also works with schools and NGOs in Bangalore and Sydney, among others, and will be teaming up with her childhood friend Ronu Majumdar for a fund raising concert organised by the promoters of Sankalp, a learning centre for children with special needs. a�?We grew up in Bombay and learnt music at the same time…we have always exchanged notes on music and life,a�? 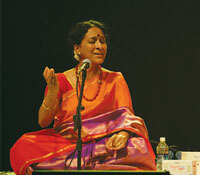 shares Jayashri, about working with her friend, flautist Majumdar. 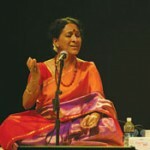 Recalling memories of singing for several of his compositions, she adds that Majumdar is one of the few who can switch between different musical styles with ease a�� something the audience will be able to see for themselves at tomorrows concert. a�?Ronuji has created six to seven tracks fusing hindustani, classical and western notes,a�? she shares. Though some of these songs have been performed as instrumentals by Majumdar in the past, this is the first time that they are adding Carnatic vocals to them, so the audience has plenty to look forward to. And if thata��s not enough, Jayashri will be seen at IMG Bangalore (for Xaviera��s Fest) next.